New face and great trip. Hi everyone, my name is Robin, and I am the new intern at INTERNeX New Zealand for nine months, I’ll be like Caro in the PR team. I’m sorry for this late first post, but I promise I will redeem myself with many other posts later this month. I come from France and live in a region called Provence. I study political sciences there but also international relations and international affairs. I arrived the 13th August and what I can say is that I have immediately been immersed into the land of the Long White Cloud. On the 15th I was supposed to leave Auckland for five days for a famil trip with Stray into the South Island, more precisely to Queenstown. But due to the ice storm, the airport in Queenstown had been closed, and as a consequence, my flight had been cancelled… The next available was not until two days, so I took the plane to Christchurch on the 16th, and joined Queenstown with the NakedBus in 8 hours. 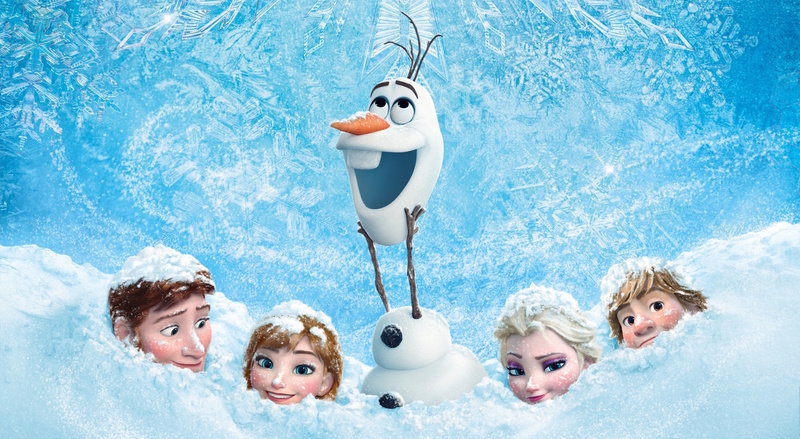 It could have been a long and boring time, but the snowy landscapes made it pass really quickly. 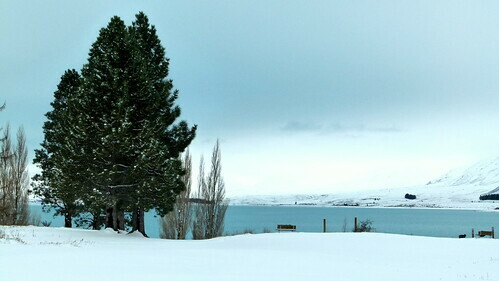 After 4 hours I arrived at the Lake Tekapo which was particularly amazing because of its azure colour that you can see below. I finally arrived in Queenstown in the evening for the beginning of the Stray famil trip. We were a group of 20, most of them were travel agents, or backpackers managers coming from all around New Zealand and Australia. 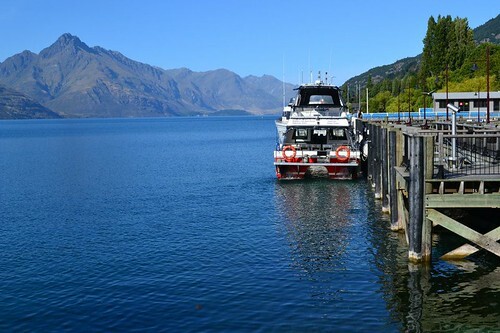 Queenstown is known to be the capital of the adventure in the world, a must-do if you travel through the South Island and especially if you like extreme sports ! The next morning, early wake-up we are heading to Bluff, the southernmost city of the South Island. There we take the ferry to Stewart Island, a preserved land of 1,746km² for only 400 permanent residents. The journey was definitely not made for the landlubbers, with waves from 1.5 meter to 2 meters, but everyone passed through with varying degrees of success. 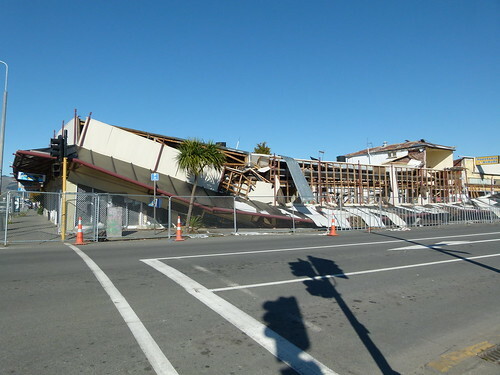 we returned to the Mainland and headed to Invercargill, one of the host cities of the Rugby World Cup. There we heard that a concert was held the same night by the kiwi band I Am Giant, which last week was #2 in the NZ Chart and have a massive success in the South East Asia, Japan, and Australia. It was a really cool concert and the singer set the room on fire for more than two hours. On Friday, we went to one of the jewels of the South Island : Milford Sound. 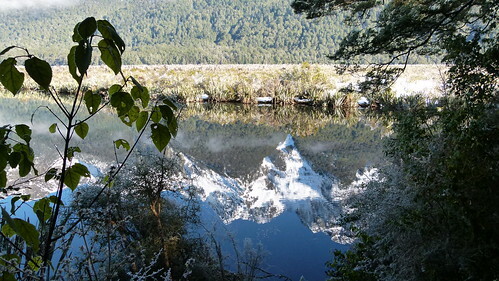 On our way to the Fiordland, we passed by the Mirror Lakes, so called because of the reflect they give of the surrounding mountains by clear weather. Milford Sound is a wonder of the nature (Rudyard Kipling called it the eight wonder of the world ! 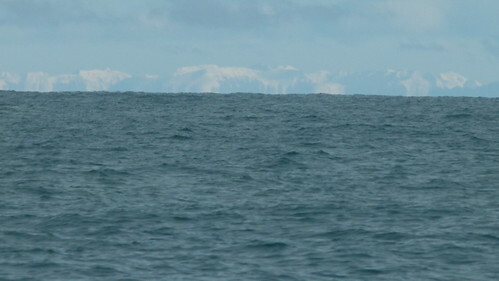 ), whatever the weather : when it is clear and sunny you can distinctly see the mountains, the cliffs… and when it rains, the mountains disappear but hundreds of waterfalls materialize. From the boat we also saw quite a few seals and penguins. We spent the night in Gunn’s Camp (a Stray exclusivity), a place out of time originally built by the pioneers and where the heating is still made by wood stoves. After a camp fire, our guide, the camp owner showed us glow worms in the bush and we held a session of « old tree free hug ». Then we headed to Mount Cook. On the road, I was challenged in my turn, but this time this was in a frozen lake that I had to swim, and well… I also took up the challenge. Since the morning, my fellow travellers had been trying to find me an icy lake where I could « blossom », and finally, after 5 hours, they found the ideal spot… They all jumped out of the bus, I approached from the lake and what I saw did not reassure me : a dead big catfish was floating on the shore of the lake. Blair, the previous bather, advised me not to hesitate and that’s what I did. You would have guessed it, I did not stay for very long in the water and when I came out my skin immediately became scarlet… Unfortunately there is no photo from my camera attesting that but they will sure come soon from others’ cameras. 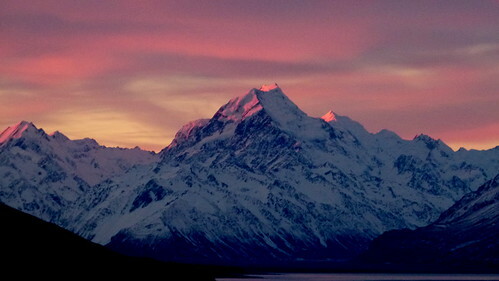 We finally arrived in sight of the Mount Cook, and at the best moment of the day : the sunset. It was pretty amazing and when we arrived in the Mount Cook village the night was there but we could distinguish the mountains surrounding us. 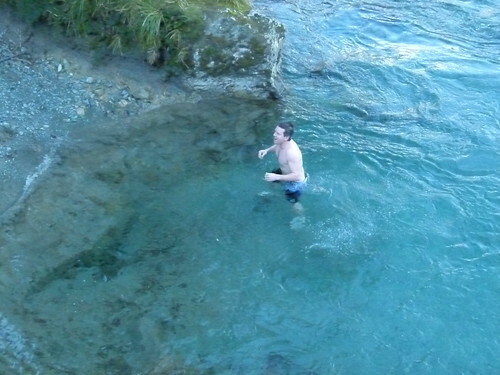 On the Sunday morning we headed to an alpine resort where we could take baths in hot pools. In the afternoon we left for Lake Tekapo where this was the time of the first separation, some went back to Queenstown and others went to Christchurch, me included. There, Andy and Gerti who were with us on the trip welcomed us in their really lovely backpackers called Old Country House which has been voted the best hostel in New Zealand for the last four out of five years. After a pizza night and the last beers of the trip, this was the time of another separation between the ones who were leaving us soon in the morning and the others in the afternoon. I did not have much time to visit Christchurch but from what I saw, the city is of course still affected by the earthquake of 22nd February, and it is really impressive to be waken up by an earthquake, which happened to me this Monday, (I have been explained later that this is really usual for the city…). 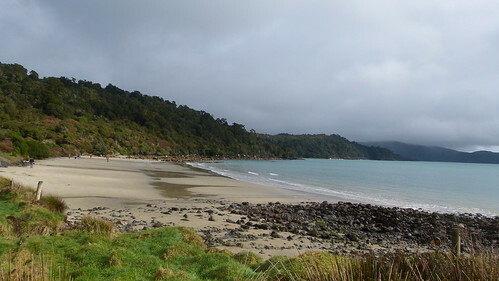 Thus ended my first trip in the South Island with Stray, I never thought I could see so many things in my first days in New Zealand, and it has comforted me that my choice of going to New Zealand was the good one. Thank you of course to Stray and INTERNeX for this amazing trip. 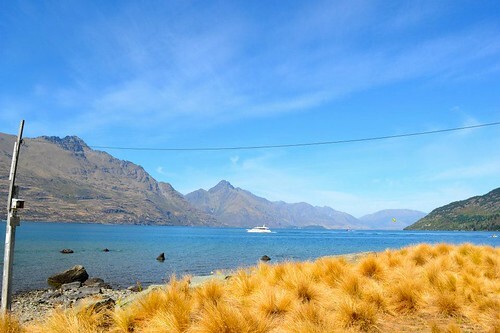 This entry was posted in INTERNeX, new zealand and tagged christchurch, famil trip, milford sound, mount cook, queenstown, south island, stewart island, stray on September 12, 2011 by ixrobin.